Ive seen or read it quiet a lot and to be honest you cant do anything right in the eyes of others. Everything you do is wrong and you get judged, it doesnt care what you wear, what you think of, how you wanna live your life or how you decided to change your eating behaviour. 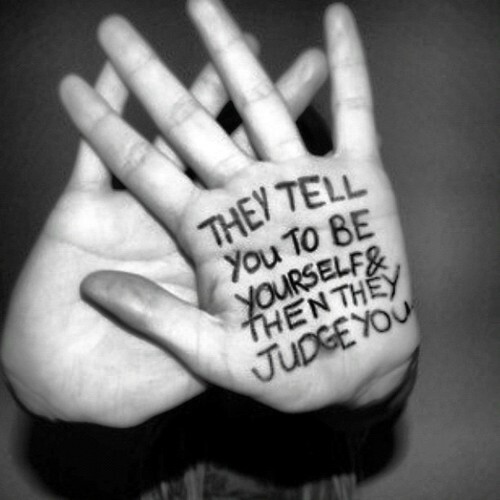 It just doesnt care people wll judge because you are diffrent and in their eyes diffrent is wrong. I cant really count how many times i got judged just because i have a different opinion on things, or just because i dye my hair. Its always the same people judge. I dont know why they always do, if they are bored or whatever, i wish people would stop judge others, why do they dont accept everyone, its a free world where everyone should live their live how they want. We have 2015 and in some countries people are still afraid to live their love life open to others, why dont we all accept love is love no matter what gender. Why does it still have to be a “wrong” attitude. ITS NOT. Why does Teenagers still get judged just because they dont wear the new Nike Airforce ? Or when they look different live a diffrent style, or whatever, people look like that because they want to, they express themself like that, dont point with a finger on them, let them alone and care about your own buisness. Or at least talk to them and ask them why they live a dffrent live to yours, you will see sometimes it can be pretty interesting. People have to stop to judge others eatng behaviour, when people want to live Vegeterian/vegan let them. Its a decision they made and they are happy with it and no they eat enough and no they dont have tp make some pills because of it o they might miss some vitamins, dont worry we are fine! Dont judge just because you dont know anything about it, better ask before you judge and you will see we get enough to eat and in the year of 2015 theres a lot of food made for Vegeterians/Vegans so dont worry. Dont be stupid and judge people who you dont know, ask them why they live like that might you find some new friends in thoose poeple who knows, i found a lot of people who are diffrent but im glad a start to talking to them because in the end we have a few things n common and we are now really good friends so stop to judge and start to talk with thoose people, theres already enough hate in this world so make a change. Every Voice is a change for something better in the future.